Modern Day central vacuum brands include Flo-Master, ModernDay, SilentMaster, AirMaster and others. Modern Day HyperFlow® Vacuum Bags are available for your Modern Day Central Vacuum Unit. These high quality filter bags are constructed from a woven cloth-like material using a 3-ply microgeometric technology. Modern Day engineered these bags for maximum airflow and maximum suction power, while still protecting the motor with high filtration. HyperFlow bags represent the most current air flow and filtering technology, creating a larger area to filter air. These bags have outstanding strength and breathability while still being thin. Modern Day HyperFlow bags also have an elastic top to secure to your vacuum’s bag area. Modern Day 8-gallon vacuum units use two-stage bag filtration. The motors are located below the bag at the bottom of the machine. Gravity assists in settling dirt downward against the lower inner layer of the 3-layer HyperFlow filter bag. Use the 8 gallon 720-5 or 720H-5 HyperFlow bags for Modern Day Silent-Master, and Flo-Master units under 34 inches tall (total length). These also fit some Action, Air-Flo, Brute, Pow-R-King, Sequoia, Star, Stor-Vac, and Thoromatic units. Use 12 gallon 721-5 or 721H-5 HyperFlow Bags for Modern Day Silent Master, FloMaster, Air Force and AirFlo Power Units that are over 34 inches in total height. On Air Force, SilentMaster, and Modern Day the bag fits over the blue cloth support. If you have converted your Modern Day central vacuum unit to a closed-bag-system using a PVC pipe for easier bag changing, Microfilter bags are also available. 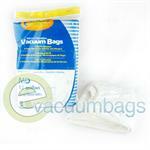 EnviroCare Paper Vacuum Bags for Modern Day 12 Gallon Central Vacuum System Model Vacuums.